Sunsets (2012) is a video by Stockholm-based artist Lisa Tan that confronts the limits of language in giving meaning to creative work. In an informal and at times difficult to follow Portuguese-to-English translation and transcription of an interview with esteemed Brazilian novelist Clarice Lispector (1920-1977), the writer is asked philosophical and technical questions about her work. In between the muffled recordings of the interviewer and interviewee’s voices, the translator struggles to find appropriate words in English, pausing, correcting herself, her clear voice followed by rapid clicks of a keyboard. 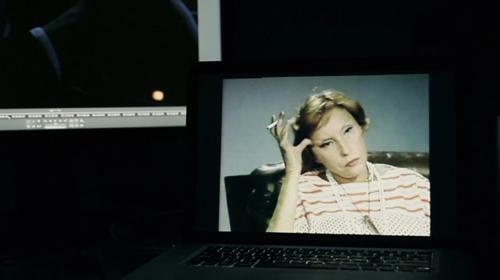 Amidst this dialogue, on screen Lispector is only periodically seen, sitting cross-legged in a television studio during her 1977 interview, while the remainder of the video entails long takes shot during the threshold time between night and day—scenes of Tan’s studio and home, and, beyond these spaces, of subtly lit twilight skies. If the conversation verges on incomprehensible, there remains an understanding of Lispector; a transmission of knowledge occurs amidst interruptions, silence, and uncertainty. Lisa Tan (born 1973, New York, USA) works in video, photography and installations to explore the intricate relationship between language and experience. In the past year her work has been presented in several exhibitions and screenings, including Duets, Cristina Guerra Contemporary Art, Lisbon; Encore!, Bonniers Konsthall, Stockholm; Just what is it that makes today so familiar, so uneasy?, LIAF Lofoten International Art Festival, Norway; On the Passage of a Few, Simon Preston, New York; The Mind Was Dreaming, Temple Bar Gallery + Studios, Dublin; and she co-curated the exhibition Cimetière d'Ixelles with Lisa Oppenheim at Art in General, New York. Tan received an MFA from the Roski School of Fine Arts, University of Southern California (USC), in Los Angeles. She currently lives in Stockholm, Sweden. Museum of Contemporary Art Santa Barbara’s exhibition and education programs are generously supported by grants from the Getty Foundation; Nordstrom; Towbes Foundation; Ann Jackson Family Foundation; High Tide Foundation; National Endowment for the Arts, and contributions from our Board of Trustees and many generous individuals. Additional support provided by the The James Irvine Foundation and organizational development grant program using funds provided by the City of Santa Barbara in partnership with the Santa Barbara County Arts Commission. Virginia Castagnola-Hunter; Luci & Richard Janssen; Rosalind Amorteguy; Marcia & John Mike Cohen; Joanne Holderman, and Gretchen & Robert Lieff. With special thanks to: CASA Magazine; Galleria Continua; Jerry Jacobs, Lost Horizon Book Store; Paseo Nuevo Shopping Center; Santa Barbara Independent; and Wayne McCall & Associates.